MI vs RCB, Head-to-Head Record: Ahead of IPL 2019 Clash, Here Are Match Results of Last 5 Mumbai Indians vs Royal Challengers Bangalore Encounters! Royal Challengers Bangalore won the first game of the season against Kings 11 Punjab ending a dreaded a run of form that saw them lose six in a row. Next up for them is a trip to Wankhede to face the Mumbai Indians whose winning run came to an end against the Rajasthan Royals. With games coming thick and fast in the Indian Premier League, there is hardly any respite for teams and RCB, in particular, have to win all the games to have any chance of making it to the next round. In terms of head to head record, in 24 games they have played - Mumbai have won 13 games while Bangalore have won 11. A look back how these two performed in their last five games. Mumbai Indians vs Royal Challengers Bangalore Live Cricket Score. The Mumbai Indians looked a bit jolted in the middle periods of their batting but a nice little cameo by Hardik Pandya, in the end, saw them reach 187/8. In reply as long as Virat Kohli and AB De Villiers were on the pitch for Bangalore they looked in control. With the fall of Kohli’s wicket, everything fell apart as RCB eventually lost the game by six runs. But controversy crept in when the umpires failed to notice a no-ball by Lasith Malinga on the last ball. 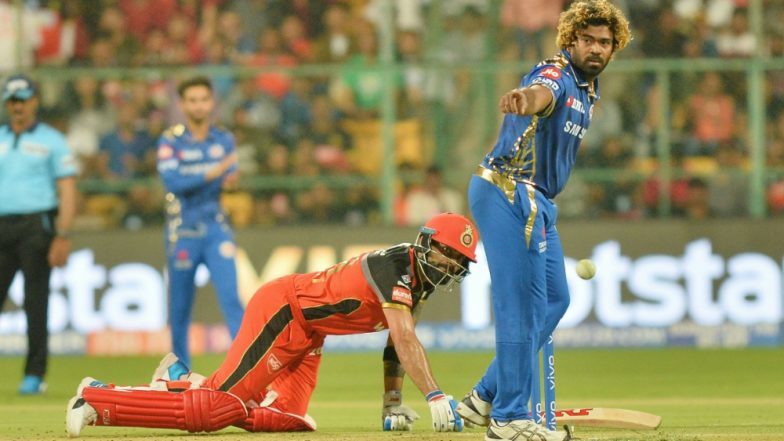 RCB vs MI IPL 2019: After Being Denied No-Ball on the Last Ball Virat Kohli Slams Umpires, Says 'Should Have Had Their Eyes Open'. Royal Challengers Bangalore put on 167/7 on board on a flat deck so disappointment in the camp was obvious. But their pacers got them back in the game with Tim Southee, Mohammad Siraj and Umesh Yadav all getting a brace each. For the Mumbai Indians, a fifty for Hardik Pandya was the only bright spot as they went down by 14 runs. A brilliant batting performance by Rohit Sharma and Evin Lewis who got 94 and 65 respectively got the hosts past two hundred run mark against RCB. Chasing a total of 214 is never easy in T20 cricket but Virat Kohli tried his best with a quick fire 92 off 62 balls. He remained not out but the other end saw quick dismissals leading to a 46 run win for Mumbai. No End to Funny RCB Memes Despite Virat Kohli and Co’s First Win of the IPL 2019. A routine win for the Mumbai Indians as they chased down a total of 162 with relative ease thanks to skipper Rohit Sharma whose unbeaten 56 sealed the game in his team’s favour. Earlier, Mitchell McClenaghan picked up three wickets and Krunal Pandya bagged a brace to restrict Royal Challengers Bangalore to 162/8. A poor effort from Bangalore batsmen meant they could only manage 142 runs in the first innings this despite having lost only five wickets. They felt to lift the team’s run rate which led to the debacle and subsequently the game. The visitors had a few hiccups in the start as they lost four wickets for seven runs but Kieron Pollard steadied their ship helping them reach the target. Enough of Funny RCB Memes! An Open Letter to Virat Kohli Haters From Royal Challengers Bangalore Fan. Both sides fancy their batting to win them the contest so it is imperative the side who bats second will have the edge.